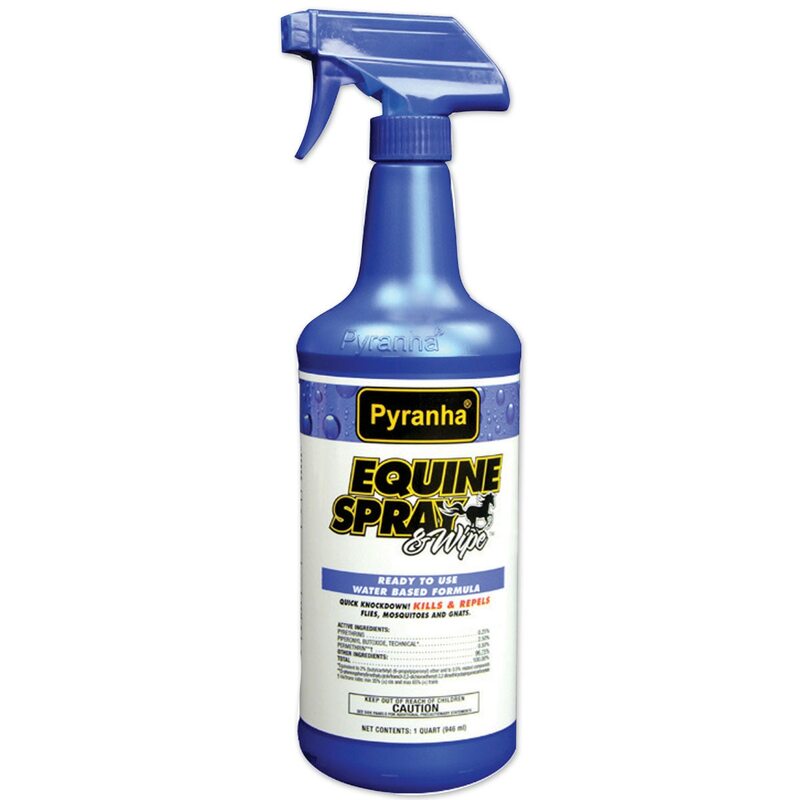 Pyranha Equine Spray™ & Wipe Insect Repellent kills and repels flies, ticks, mosquitoes and gnats. The water-based formula won't attract dust and grime, and offers long-lasting protection against a wide array of insects. This repellent can be effective for up to 30 days. 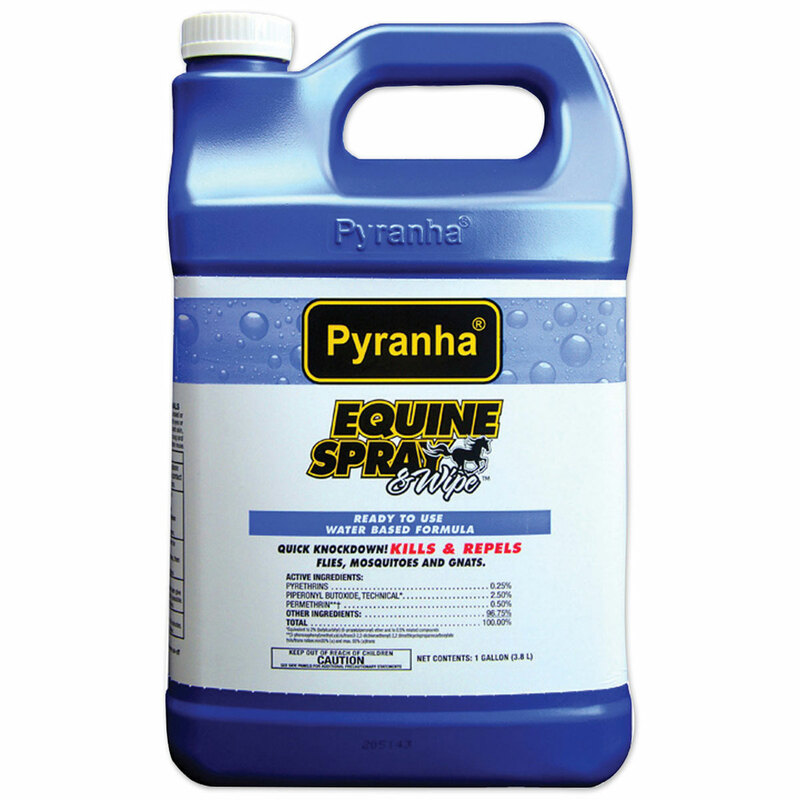 Pyranha Equine Spray™ & Wipe Insect Repellent is rated 5.0 out of 5 by 15. Rated 5 out of 5 by covertocover18 from A Fly Spray that Works I bought this after a recommendation from a barn friend who uses the yellow Pyranha spray. I decided to go with the water formula so it would attract less dust as that was her only complaint about the yellow bottle. I think this spray actually does work and it does not collect too much dust on your horse. I notice less bug bites on my sensitive skin horse which makes me very happy. This will be the only fly spray I use from now on. Rated 5 out of 5 by Newottbmom from Best Fly spray yet! This is the best fly spray I’ve used! Love that it’s water based. With the oil based sprays we all know that look of the dirt heading up on the oil. That does not happen with this spray! And it works! My horses get immediate relief from the bugs! My only issue was the first bottle broke in transit and I had a soaking, leaking box arrive on my porch. Of course, smartpak immediately sent me a replacement! Rated 5 out of 5 by Gwenz from Great fly spray I have used this for a couple of years on my 3 horses. It really does a nice job of keeping the biting flies away from them. Love it! And the nice lemon scent too. Rated 5 out of 5 by Ferzzie from Great for sensitive skin I've been using Pyranah fly spray for years. The oil based spray started making my Arabian's skin peel. I switched to the water based and no more peeling skin. I have tried more "natural" sprays, but none compare to Pyranah! Rated 5 out of 5 by Betty12 from Great product Best product on the market. I have a mare who cannot tolerate any insects and she stays happy outside with this fly spray applied. Rated 5 out of 5 by Martha from Works great! Although the fly season has not started in full force yet I like to be prepared. I have used this product many times and find it very effective for controlling the flies. Rated 5 out of 5 by Jmw22 from Water-based formula doesn't attract dirt! What an improvement to the original product. Same performance without the dirt attracting lanolin. Rated 5 out of 5 by LoveMy3Horses from Works great and does not attract dirt! I had been a very loyal user to the original oil-based Pyranha Spray & Wipe, however I wasn't a huge fan of the greasy texture and the dirt/dust/grime it would attract to my horses. I tried this water-based version thinking maybe it wouldn't be as effective, but it is! Not only does it work just as well as the oil-based spray, it does NOT attract dirt to your horse, which I LOVE, and you don't have to use so much of it! The effectiveness lasts through my entire rides every time. Definitely my favorite spray!